ST. GEORGE — A man was charged with assault Tuesday after he allegedly pulled a weapon on an individual that the defendant believed was trying to poison him, an accusation that police deemed unfounded. Shortly after 4 p.m. Monday officers responded to an apartment complex located in the 300 block of West 200 South after a man called 911 reporting that his roommate pointed a gun at him and threatened him with violence. “This initially came in as a brandishing call, where the suspect drew a weapon on the man who called 911,” Officer Lona Trombley with the St. George Police Department said. Officers found the 68-year-old suspect, David Golden Morgan, in front of the apartment with a Sig-Sauer 9 mm handgun in the right front pocket of his pants, police said, adding that they also discovered a fully loaded clip in the gun. Both men were questioned by police, and the man who called 911 told officers that he was moving out of the residence when the incident occurred. He told police that he and Morgan live in the same home, but maintain separate living quarters, according to the probable cause statement filed with the court Tuesday. The man was loading his personal belongings into a pickup truck parked behind the residence, which was also directly behind Morgan’s bedroom wall. Hearing the commotion, Morgan went outside to where the man was loading the truck and, when he saw who it was, returned to the inside of the house and retrieved his firearm before confronting the roommate outside. The man told police that Morgan had accused him of trying to poison him on multiple occasions, a claim the man denied. 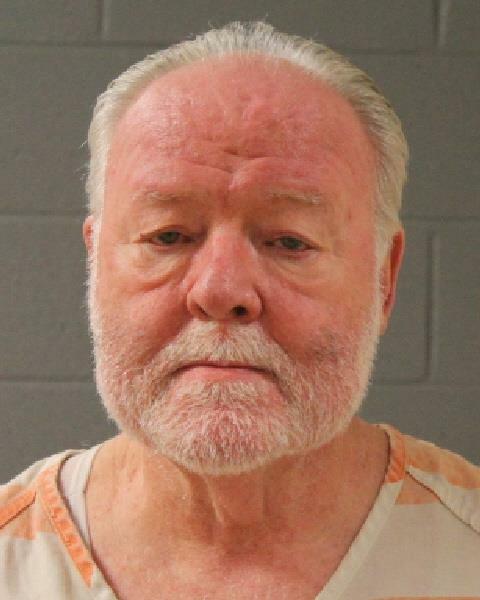 “There had been several prior reports where Morgan believed that the victim was trying to poison him, all of which were unfounded,” Trombley said. Morgan approached the man on the sidewalk with the weapon drawn and held next to his waist, and the roommate turned around to see the gun pointed directly at his stomach, according to court records. Morgan addressed the roommate and said something to the effect of “If I catch you trying to spray poison into my bedroom I’m going to take care of the problem myself,” police said. The roommate told officers that he was moving because of Morgan’s repeated claims that he was trying to poison him, and said he believed that Morgan was going to shoot him just before they arrived. “The victim said that Morgan threatened him while pointing the muzzle of the gun directly at him, and he was terrified,” Trombley said. Police said that both men’s statements were similar. Morgan told officers he had a valid concealed weapons permit, but did not present the card or any proof, nor was it stated on his driver’s license. A background check revealed that Morgan had a prior charge of unlawfully concealing a weapon, which led detectives to believe “it is probable that David does not have a concealed carry permit,” the statement said. Morgan was arrested and transported to Purgatory Correctional Facility where he was booked on two offenses, including aggravated assault with a weapon, a third-degree felony, and use of a concealed weapon in a violent felony, a second degree felony. Morgan appeared in court Tuesday and was formally charged with one count of aggravated assault, while the first-degree concealed weapon offense was dropped. Bail was set at $5,000 and Morgan remains in jail as this report publishes. If he was convicted of a felony for the prev concealed charge, he would have been in a lot deeper water. Thanks to guns this event ended well for all involved. Remember folks, an armed society is a safe society. Did it frighten you little snowflake? Roger roger. Understood. Your fear of strangers, a diminishing testosterone level and a slightly creepy demeanor make you more comfortable being armed. go back to sleep, Nolan. Leland, you are correct. But once again we see a lot of charges tacked on to see what will stick. They also throw a bunch of charges on so they have plea wiggle room. Why not just charge him with what he ultimately did, instead of all the little minutia that just seems to clog up our court systems. If this is reported accurately, the Carrying Concealed without a lic. charge, does not seem to fit for many reasons. And I’m sure how this should have been written is that when they “ran his DL, It did not show he had a permit”. That little detail pops up pretty quick from BCI when the DL is run. Charge him for the Real Crime for crying out loud! According to the article – the handgun was found in his pants pocket. That would be concealed carry. Author — it is a fully loaded MAGAZINE, not a clip.